Sydney by Helicopter aboard a Sydney HeliTours helicopter. Check out the harbour, Bondi, Northern Beaches, & much more. Whether you are a visitor to the harbour city of Sydney, or a resident, one of the most spectacular ways to check our great metropolis is to take in Sydney by helicopter - a "joy flight". I've been up several times, and the experience is memorable, to say the least. Sydney HeliTours offers high quality helicopter services from their location at the Mascot Heliport (Sydney Airport), including the aforementioned Sydney joy flights. It's relatively inexpensive too, at only $209 for a booked flight (per person), or they even have weekend standby seats at $99 each. Apparently they are the largest scenic helicopter company in Sydney, and the company flies more passengers around Sydney Harbour and its surrounds than any other helicopter company. Having been in operation since 1993, they estimate that they have flown over 143,000 passengers over Sydney from all over the world. The company doesn't only do Sydney joy flights either - they also cater for tailored helicopter tours and scenic flights, aerial film and photography platforms, as well as corporate charter and transfers. And their fleet is as you would expect from a company with such along history - well maintained and beautifully presented, and operated all year round. Check out the video below, showing a small part of a joy flight around the Sydney Harbour Bridge, The Opera House, and the city itself. The sound track provided courtesy of my friends, Black Label Australia, with Steve Mulry singing lead vocals. 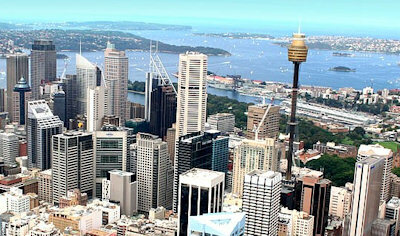 Sydney HeliTours offers aerial film and photography platforms under its associated company Helicopter Film Services Pty Ltd. Helicopter Film Services provides fully customised aerial platforms to tailor to your needs, whatever they may be. From hand held stills, right up to Cinema quality High Definition footage, it seems Sydney HeliTours has a solution for need. They have Sydney's best fleet of modern, low hour, executive helicopters for efficient and comfortable passenger transfer. Comprising a Eurocopter EC120, a Bell 407 and a twin engine Augusta 109, they are able to deliver the right helicopter for your executive helicopter requirements. Sydney HeliTours can provide a fast and efficient helicopter transfer service for executives and other personnel too. Arrive at your destination faster and fresher without the delay of congested roads and red lights. They also have an air conditioned shuttle bus which is available as a complimentary pick up and drop off service if required. Regular transfer points include Newcastle, the Hunter Valley, Gosford, Wollongong and many other locations. If you are looking to reward your staff, what better way than with a scenic flight over the picturesque Sydney Harbour, OR a whole day out based around a helicopter flight? There are a number of package options including golf days, bush walking in the Blue Mountains, lunch in an exotic location, full and half day pub tours, plus many more options to choose from. Their friendly staff are also able to work with you to tailor a specific itinerary to suit your organisation's requirements.